Searching for a great sandwich spot downtown? Look no further. Meatball sandwich. What comes to mind? Perhaps a scanty cluster of round clumps lifelessly treading in diluted tomato sauce? The restaurant veterans behind Meat & Bread, a new, brilliantly designed sandwich shop kitty corner from Victory Square is serving an exciting version of the classic ($7). 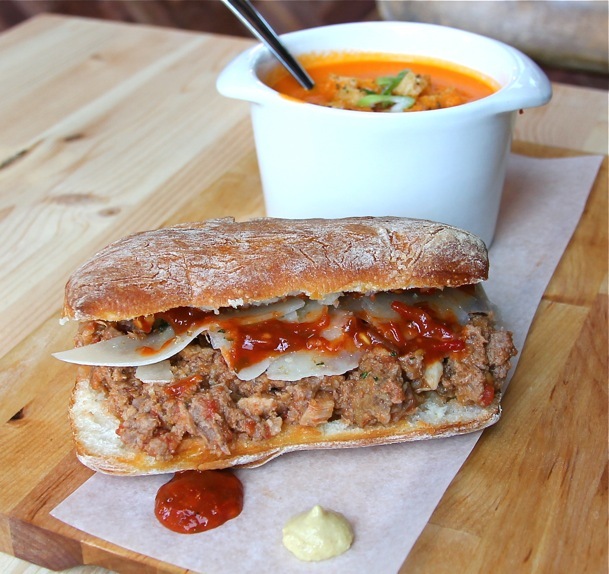 The creation’s full-flavoured filler — a blend of beef and pork — sits loosely on a mini hot-out-of-the-oven ciabatta loaf. Sprinkles of breadcrumbs (for crunch) are added along with Meat & Bread’s own garlicky, spicy sambal. The finishing touch is sharp Romano cheese, shaved thinly and placed to melt on the hot meat. Drops of house-made French mustard and sambal — vital for dipping — are included on your lunch’s paper-lined wooden board. Other sandwich options: porchetta ($8), grilled cheddar ($7) and the roast of the day ($8). For dessert, try the maple bacon ice cream sandwich ($3) — it’s to die for.